Merchant processing is the acceptance, processing, and settlement of payment transactions for merchants. A bank that contracts with (or acquires) merchants is called an acquiring bank, merchant bank, or acquirer. Acquiring banks sign up merchants to accept payment cards for the network and also arrange processing services for merchants. They can contract directly with the merchant or indirectly through agent banks or other third parties. A bank can be both an issuing bank and an acquiring bank, but banks most often specialize in one function or the other. Merchant processing is a separate and distinct line of business from credit card issuing. It is generally an off-balance sheet activity with the exception of merchant reserves and settlement accounts, both of which are discussed later in this chapter. Merchant processing involves the gathering of sales information from the merchant, obtaining authorization for the transaction, collecting funds from the issuing bank, and reimbursing the merchant. It also involves charge-back processing. The vast majority of merchant transactions are electronically originated (as compared to paper-based) and come from credit card purchases at merchant locations or the point-of-sale (POS). Merchant processing increasingly includes transactions initiated via debit cards, smart cards, and electronic benefits transfer (EBT) products. The payment networks are the center of the cardholder transaction process and maintain the flow of information and funds between issuing banks and acquiring banks. In a typical cardholder transaction, the transaction data first moves from the merchant to the acquiring bank (and through its card processor, if applicable), then to the Associations, and finally to the issuing bank (and through its card processor, if applicable). The issuing bank ultimately bills the cardholder for the amount of the sale. Clearing is the term used to refer to the successful transmission of the sales transaction data. At this point, no money has changed hands; rather, only financial liability has shifted. The merchant, however, needs to be paid for the sale. Settlement is the term used to refer to the exchange of the actual funds for the transaction and its associated fees. Funds to cover the transaction and pay the merchant flow in the opposite direction: from the issuing bank to the Associations, to the acquiring bank, and finally to the merchant. The merchant typically receives funds within a few days of the sales transaction. In a simple form, the clearing and settlement processes for payments can be illustrated with a standard four-corners model (as discussed in the FFIEC IT Examination Handbook, Retail Payment Systems Handbook (March 2004)). 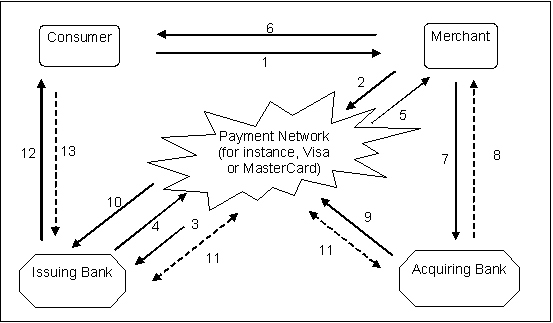 In this model, there is a common set of participants for credit card payments: one in each corner (hence, the term four-corners model) and one in the middle of the diagram. The initiator of the payment (the consumer) is located in the upper left-hand corner, the recipient of the card payment (the merchant) is located in the upper right-hand corner, and the relationships of the consumer and the merchant to their banks (the issuing bank and the acquiring bank, respectively) reside in the bottom two corners. The payment networks that route the transactions between the banks, such as Visa, are in the middle of the chart. The information and funds flows for a typical credit card transaction are illustrated in a four-corners model13 labeled Exhibit D on the next page. Information flows are presented as solid lines while funds flows are represented by dashed lines. Step 1: The consumer pays a merchant with a credit card. Steps 2 and 3: The merchant then electronically transmits the data through the applicable Association's electronic network to the issuing bank for authorization. Steps 4, 5, and 6: If approved, the merchant receives authorization to capture the transaction, and the cardholder accepts liability, usually by signing the sales slip. Steps 7 and 8: The merchant receives payment, net of fees, by submitting the captured credit card transactions to its bank (the acquiring bank) in batches or at the end of the day14. Steps 9 and 10: The acquiring bank forwards the sales draft data to the applicable Association, which in turn forwards the data to the issuing bank. The Association determines each bank's net debit position. The Association's settlement financial institution coordinates issuing and acquiring settlement positions. Members with net debit positions (normally the issuing banks) send funds to the Association's settlement financial institution, which transmits owed funds to the receiving bank (generally the acquiring banks). Step 11: The settlement process takes place using a separate payment network such as Fedwire. Step 12: The issuing bank presents the transaction on the cardholder's next billing statement. Step 13: The cardholder pays the bank, either in full or via monthly payments. Exhibit D is only a simplistic example of the variety of arrangements that can exist. The parties for the transaction could be one of thousands of acquirers or issuers or one of millions of merchants and consumers. Further, there are many other ways the arrangements can be structured. For example, in on-us transactions, the acquiring bank and the issuing bank are the same. Also, the timing of the payment to the merchant (step 8 of Exhibit D) varies. Some acquiring banks pay select merchants prior to receiving funds from the issuing bank, thereby increasing the acquiring bank's credit and liquidity exposure. However, payment from the acquiring bank to the merchant often occurs shortly after the acquiring bank receives credit from the issuing bank. The presence of third-party organizations coupled with the acquiring bank's ability to sub-license the entire merchant program, or part thereof, and the issuing bank's ability to sub-license the entire issuing program, or part thereof, to other entities also introduces complexities to the transaction and fund flows. For example, because the cost of technology infrastructure and the level of transaction volume are high for acquiring banks, most small acquiring banks rely on third-party card processors to perform the functions. In addition, issuing banks often use card processors to conduct several of their services. In intra-processor transactions, the same third party processes for both the acquiring bank and the issuing bank. Under the by-laws and operating rules/regulations of the Associations, the issuing banks and acquiring banks are responsible for the actions of their contracted third-parties, respectively. A merchant submits sales transactions to its acquiring bank by one of two methods. Large merchants often have computer equipment that transmits transactions directly to the acquiring bank or its card processor. Smaller merchants usually submit transactions to a vendor that collects data from several merchants and then transmits transactions to the acquiring banks. Some bankers do not understand merchant processing and its risks. Attracted to the business by the potential for increased fee income, they might underestimate the risk and not employ personnel with sufficient knowledge and expertise. They also might not devote sufficient resources to oversight or perform proper due diligence reviews of prospective third-parties. Many banks simply do not have the managerial expertise, resources, or infrastructure to safely engage in merchant processing outside their local market or to manage high sales volumes, high-risk merchants, or high charge-back levels. Many of a bank's risks may be interdependent with payment system operators and third parties. For example, the failure of any payment system participant to provide funding for settlement may precipitate liquidity or credit problems for other participants, regardless of whether they are party to payments to or from the failing participant. A primary risk associated with merchant processing is credit risk. Even though the acquiring bank typically does not advance its own funds, processing credit card transactions is similar to extending credit because the acquiring bank is relying on the creditworthiness of the merchant to pay charge-backs. Charge-backs are a common element in the merchant processing business and are discussed in more detail later in this chapter. They can result from legitimate cardholder challenges, fraud, or the merchant's failure to follow established guidelines. Charge-backs become a credit exposure to the acquiring bank if the merchant is unable or unwilling to pay legitimate charge-backs. In that case the acquiring bank is obligated to honor the charge-back and pay the issuing bank which could result in significant loss to the acquiring bank. In a sense, the acquiring bank indemnifies a third party (in this case, the issuing bank that in turn indemnifies the cardholder) in the event that the merchant cannot or does not cover charge-back. Banks have been forced to cover large charge-backs when merchants have gone bankrupt or committed fraud. Acquiring banks control credit risk by using sound merchant approval processes and closely monitoring merchant activities. Acquiring banks are faced with the transaction risk associated with service or product delivery because they process credit card transactions for their merchants daily. The risk can stem from a failure by the bank or any party participating in the transaction to process a transaction properly or to provide adequate controls. It can also stem from employee error or misconduct, a breakdown in the computer system, or a natural catastrophe. The acquiring bank needs an adequate number of knowledgeable staff, appropriate technology, comprehensive operating procedures, and effective contingency plans to carry out merchant processing efficiently and reliably. A sound internal control environment is also necessary to ensure compliance with the payment networks' rules. Formal reconciliation processes are also essential to limiting risk. The high transaction and sales volume normally encountered with merchant processing programs creates significant transaction and liquidity risks. A failure anywhere in the process can have implications on the bank. Examples include an issuing bank's inability to fund settlement to the acquiring bank or a processing center's failure to transmit sales information to the issuing bank, thus resulting in a delay of or failure of funding to the merchant bank. Liquidity risk can be measured by the ability of the acquiring bank to timely transmit funds to the merchants. Acquiring banks often limit this risk by paying merchants after receiving credit from the issuing bank. If the acquiring bank pays the merchant prior to receiving credit from the issuing bank, the acquiring bank could sustain a loss if the issuing bank is unable or unwilling to pay. Some acquiring banks delay settlement and pay merchants one day after receiving the funds from the issuing bank. The delay allows the acquiring bank time to perform fraud reviews. For delayed settlement, which most commonly occurs when transactions are identified as suspicious or unusual, management is expected to have established formal procedures. Because merchant deposits can be volatile, risk may also arise if the acquiring bank becomes reliant on the merchant's deposits as a funding source for other bank activities. Furthermore, substantial charge-backs could potentially strain the bank's financial condition and/or reputation to such a degree that its creditors may withdraw availability of borrowing lines. Associations guarantee settlement for transactions that pass through interchange. As a result, they may require collateral pledges/security if a bank's ability to fund settlement becomes questionable. This can create significant liquidity strains and potentially capital difficulties, depending on the size of the collateral requirement and/or the financial condition of the bank. The Associations' rules allow them to assess the banks directly through the settlement accounts if the bank is not forthcoming with the collateral. Compliance risk arises from failure to follow payment networks' rules and regulations, clearing and settlement rules, suspicious activity reporting requirements, and a myriad of other laws, regulations, and guidance. It can lead to fines, payment of damages, diminished reputation, reduced franchise value, limited business opportunities, reduced expansion potential, and lack of contract enforceability. Acquiring banks can limit compliance risk by ensuring a structured compliance management program is in place, the internal control environment is sound, and staff is knowledgeable. They can also limit risk by providing staff with access to legal representation to ensure accurate evaluation of items such as new product offerings, legal forms, laws and regulations, and contracts. Strategic risk arises from adverse business decisions or improper implementation of those decisions. A failure by management to consider the bank's merchant processing activities in the context of its overall strategic planning is normally cause for concern. A decision to enter, maintain, or expand the merchant processing business without considering management's expertise and the bank's financial capacity is also normally cause for concern. Examiners should also pay close attention to how the acquiring bank plans to keep pace with technology changes and competitive forces. Examiners should look for evidence that the strategic planning process identifies the opportunities and risks of the merchant processing business; sets forth a plan for managing the line of business and controlling its risks; and considers the need for a comprehensive vendor management program. An evaluation of management's merchant processing expertise is critical to judging strategic risk. The bank's overall programs for audit and internal controls, risk management systems, outsourcing of services, and merchant program oversight are key to controlling the strategic risk. Reputation risk arising from negative public opinion can affect a bank's ability to establish new relationships or services or to continue servicing existing relationships. This risk can expose the bank to litigation, financial loss, or damage to its public image. The bank's business decisions for marketing and pricing its merchant processing services can affect its reputation in the marketplace. Reputation risk is also associated with the bank's ability to fulfill contractual obligations to merchants and third parties. Most notably, the outsourcing of any part of the merchant processing business easily increases reputation risk. Decisions made by the acquiring bank or its third-parties can directly cause loss of merchant relationships, litigation, fines and penalties as well as charge-back losses. Concerns normally arise when the acquiring bank does not maintain strong processes for performing due diligence on prospective merchants and third-parties or perform ongoing evaluations of existing merchant and third-party relationships. Examiners should expect that management fully understand, prior to becoming involved in merchant processing and continuing thereafter, the risks involved and its own ability to effectively control those risks. Merchant programs are specialized programs that require management expertise, significant operational support, and rigorous risk-management systems. It can be a profitable line of business but, if not properly controlled, can result in significant risk to the bank. Examiners should determine whether qualified management has been appointed to supervise merchant activities and to implement a risk management function that includes a merchant approval system and an ongoing merchant review program for monitoring credit quality and guarding against fraud. Bank staff's knowledge and skill-sets are expected to be commensurate with the risks being taken. For example, personnel responsible for processing charge-backs should have the technical knowledge and understanding of charge-back rules, and personnel responsible for approving merchant applications should have the ability to properly evaluate creditworthiness and identify high-risk merchants. Examiners assessing risks of merchant programs should direct their attention to situations in which management has not put proper risk measurement systems in place to operate, monitor, and control the activity effectively. This includes situations that evidence the absence of regular management reports detailing pertinent information. Key reports generally include new merchant acquisitions, merchant account attrition, merchant portfolio composition, sales volumes, charge-back volumes and aging, fraud, and profitability analyses. Clear lines of authority and responsibility (for example, the level of approval required to contract with certain types of merchants). Markets, merchant types, and risk levels the bank is and is not willing to accept. Limits on the individual and aggregate volume of merchant activity that correlates with the bank's capital structure, management expertise, and ability of operations to accommodate the volume (e.g., human and systems resources) as well as with merchants' risk profiles. Goals for portfolio mix and risk diversification, including limits on the volume of sales processed for higher-risk merchants and that take into account the level of management expertise. Merchant underwriting and approval criteria. Procedures for monitoring merchants, including financial capacity, charge-backs and fraud (regardless of who originates the merchants for the bank). Criteria for determining appropriate holdback or merchant reserve accounts. Procedures for settlement, processing retrieval requests and charge-backs, handling complaints, monitoring and reporting of fraud, and training personnel. Guidelines for accepting and monitoring agent banks. Guidelines for handling policy exceptions. MIS to keep management sufficiently informed of the condition of, and trends in, the merchant program. Examiners should insist that the bank hold capital sufficient to protect against risks from its merchant business. In addition, they should determine whether management has established sound risk limits on the merchant processing volume based on the bank's capital structure, the risk profile of the merchant portfolio, and the ability of management to monitor and control the risks of merchant processing. Associations limit the processing volume a bank can generate based upon the bank's capital structure, high-risk merchant concentrations, and charge-back rates. Banks operating outside the established thresholds (which may vary and are subject to change) are generally considered to be high-risk acquiring banks by the applicable Association and may be subject to additional activity limits or collateral requirements. Risk Weighted Off-Balance Sheet Items for Merchant Processing = Average monthly merchant sales (Annual Merchant Sales/12) X 2.5 X 20 percent (conversion factor for off-balance sheet items) X 100 percent (risk weight category)16. Tier 1 capital / (Average Total Assets + Risk Weighted Off-Balance Sheet Items for Merchant Activity). Define criteria for accepting merchants (for example, acceptable business types, time in business, location, sales and charge-back volumes, and financial capacity). Establish underwriting standards for the review of merchants. Define what information is required on the merchant application. Stipulate what information is required in the merchant agreement. Outline procedures and time frames for periodic review of existing relationships. A signed merchant processing agreement. A signed corporate resolution, if applicable. Analysis of credit bureau reports on the principal(s) of the business. Evaluation of financial statements, tax returns and/or credit reports on the business. Analysis of prior merchant activity, such as the latest monthly statements from the most recent processor. Analysis of projected sales activity (for instance, average ticket amount, daily/monthly sales volume). Assessment of any existing relationship (for example, a loan) with the bank. Consideration of the line of business and/or the product(s) offered by the merchant. Verification of trade and bank references. Evidence as to whether the merchant is on the Member Alert To Control High Risk Merchants (MATCH) system. Proper review by management normally includes conducting a background check on the business's principal(s), scrutinizing personal credit reports for derogatory information, and verifying addresses. Where appropriate and allowed by law, management may also perform a criminal background check. If a merchant is listed on MATCH, management is expected to contact the listing bank regarding the termination reasons. MATCH status can help a bank determine whether to implement specific actions or conditions if a merchant is accepted. Examiners should pay attention to instances in which management has not carefully investigated a merchant listed on MATCH or in which their decision to accept or refuse a merchant has been solely based on the merchant being listed or not being listed on MATCH. The goal of on-site inspections is to verify a merchant's legitimacy. The absence of documentation of the inspections, including photographs and a written inspection report normally is cause for concern as are situations in which the inspection was conducted by an individual who has a financial interest in its outcome. Acquiring banks signing merchants remotely sometimes find performing inspections themselves difficult or expensive. Often other acquiring banks or third parties will perform site inspections on an exchange or fee basis. In these cases, examiners need to assess whether management is well-informed of the other parties' inspection procedures and ensures that the procedures are, at a minimum, consistent with procedures management would use if conducting a proper inspection itself. The merchant's line of business and/or the products offered as well as its marketing practices are key factors for management to consider when it evaluates the credit quality of a merchant. The Associations segment merchants according to activity because the type of activity often is a good indicator of risk. Thus, it stands to reason that examiners may expect acquiring banks to continually analyze their merchant portfolios along similar guidelines. Acquiring banks typically compile a prohibited or restricted merchant list which includes the types of merchants they are unwilling to sign or are willing to sign only under certain circumstances. While the extent of product and marketing evaluations varies, considerations normally include review of the merchant's business plans, merchandise, and marketing practices and materials (for example, catalogs, brochures, telemarketing scripts, and advertisements). In addition, shipping, billing, and return policies can be reviewed for unusual or inappropriate practices (for instance, customers being billed long before merchandise is shipped). These considerations can help determine, among other things, if: the business is of a type that typically has high charge-back rates; the merchant is selling a legitimate product; sales methods are legitimate and not deceptive; product quality and price are consistent with projected sales and charge-back rates; and customers will be satisfied with products ordered. Merchants offering low-quality products or services tend to incur more charge-backs, thus dissuading many banks from signing them. The merchant's sales volume and time frame within which product delivery is completed are other considerations to evaluate risk. Generally, the greater the sales volume and the longer the time between transactions and product delivery, the greater the risk. For example, when a restaurant closes, an acquiring bank typically has less exposure to charge-backs for undelivered goods and services. In contrast, the failure of a travel agency could expose an acquiring bank to substantial charge-backs due to the high volume of reservations common in the travel agency business. Criteria for determining the types of merchants the bank is or is not willing to sign and under what circumstances. Increased emphasis on underwriting considerations regarding products and marketing in evaluating the merchants. Limitations on the volume of high-risk merchant transactions processed relative to the bank's total merchant portfolio. Criteria for determining the appropriate level of holdback or reserve accounts to sufficiently cover the level of credit risk. Appropriate pricing of these merchants in relation to the charge-back risk and any costs associated with increased monitoring. Heightened monitoring and problem resolution. For example, for charge-back monitoring, banks may set lower charge-back thresholds for required remedial action and/or a shorter timeline for problem resolution for those merchants exceeding acceptable charge-back thresholds. Compliance with bankcard regulations regarding registration of certain high-risk merchants and assigning proper Merchant Category Codes (MCC) to merchants. Requirements for cardholder information security. Prohibition of split sales drafts and laundering of sales drafts. Merchant liability (for example, charge-backs and reserves). Notification of ownership changes or substantive marketing and product changes. Right to hold funds (for example, bank's right to freeze deposits when fraudulent activity suspected). Internet provisions (for example, encryption and web-site displays). Concerns normally become elevated when management is not monitoring the financial condition of high-volume and high-risk merchants on an ongoing basis and/or when the bank's policy has not addressed the frequency of reviews and the size of merchants requiring reviews. Examiners should assess management's practices for considering volume, concentrations, high-risk industries, and charge-back history in establishing the thresholds for periodic reviews. Depending on the composition of the bank's merchant portfolio, examiners may not necessarily expect the bank to conduct credit reviews of smaller merchants on an ongoing basis if the bank used sound underwriting guidelines at acquisition and if the bank is using strong controls to monitor all merchant transactions, including fraud and charge-back monitoring. Examiners might observe cases in which databases (for items such as risk scores and bankruptcy filings) are used to periodically screen the merchant portfolio. Communication between merchant program and loan personnel regarding changes in the merchant's credit quality is key part of assessing any shared banking relationships. For example, an unacceptable charge-back rate for a merchant might indicate emerging credit quality problems that could trigger the need to review any lending relationships with the merchant. Likewise, concerns that identify merchants as problem borrowers could trigger the need to review merchant arrangements. If credit information shows deterioration in the merchant's financial condition, the bank may want to reduce its risk exposure from merchant processing. For instance, when dealing with a financially-unstable merchant, the bank might require a holdback or security deposit, as discussed later in this chapter. The lower level of barriers encountered when setting up an Internet merchant increases the risk of fraudulent businesses or businesses with minimal financial resources being established compared to the risks associated with traditional merchants. This risk elevates the need for acquiring banks to conduct thorough underwriting reviews of internet merchants. Whether fraud and charge-back risks warrant additional risk-mitigation techniques, such as delaying settlement or setting up reserves, is a critical decision that normally occurs during the underwriting process. Description of goods and services offered. Privacy statements (permissible uses of customer information). One of the key aspects of a successful merchant program is appropriately setting the fees that the merchant will be charged for sales transactions and acquiring bank services. Merchant pricing is extremely competitive, especially for large- and national-scale merchants who generate high transaction volumes. High transaction volumes can lead to economies of scale and possibly increased income. Examiner should look for evidence that banks have adopted a pricing policy that outlines the methods used for pricing, authority levels, and repricing procedures. A pricing policy can facilitate consistency in pricing practices and help optimize profit margins. Acquiring banks use various methods to price merchants. Smaller merchants are frequently priced with a single discount rate based on merchant volume and average ticket size. Acquiring banks frequently use unbundled pricing for medium to large merchants. Unbundled pricing is the method of assigning fees for the cost of each service used. Examples of unbundled services include interchange, authorizations, and charge-backs. Other fees may include, but are not limited to: statement preparation, application, customer service, membership, maintenance, and penalty fees (for example, for violating payment network rules). Examiners should evaluate the bank's practices for ensuring that pricing is consistent with the risk posed by the merchant. Acquiring banks sometimes use a pricing model to determine the target discount rate. They might maintain one or more pricing models, with model usage driven by the merchant's sales volume and/or industry classification. Pricing models allow the acquiring bank to quickly substitute variables regarding sales volumes, average ticket size, revenues and expenses to produce a projected profit margin. A failure of the pricing model to include all direct and indirect expenses may render the model's results meaningless. A model's accuracy depends upon the reasonableness of the assumptions used. Acquiring banks assign a discount rate for each merchant when the merchant agreement is signed. The discount rate is the percentage that gets "discounted" off the transaction amount that is paid to the merchant, hence the term discount rate. In a simple case, the discount represents a single rate charged to a merchant based on the merchant's sales volume. For example, a merchant with a 2 percent discount rate receives $98 for a $100 credit card sale. Most merchant agreements allow the acquiring bank to change the discount rate for various cost increases. Numerous factors influence the discount rate charged, including, but not limited to, the transaction method, processing volume, and type of merchant business. For example, merchants who use electronic data capture (EDC) are typically charged lower discount rates than paper-based merchants. Discount rates generally range from 1 to 4 percent for small to medium-size merchants and sometimes well below that range for large-volume merchants. When considering the range of discount rates used by the bank, examiners should call on management to readily explain outliers, including those that are well below the normal range. Banks sometimes give merchants a favorable discount rate because of existing commercial loan or deposit relationships. In other cases, the discount rate is favorable due to a credit card equipment lease arrangement. Packaging may be an acceptable practice, but does not eliminate the need to measure the overall profitability of a merchant relationship. Further, examiner attention should be drawn to situations in which management has offered favorable discount rates to insiders or their related interests. Interchange fees represent compensation paid by the acquiring bank to the issuing bank. Thus, they are recorded as an expense on the acquiring bank's income statement and as a revenue source on the issuing bank's income statement. Interchange fees are based on several factors such as volume, size, and type of transaction and are usually set by the Associations. They average less than two percent of the purchase price and are typically one of many considerations in determining the size of the discount rate that the acquiring bank charges the merchants. (For on-us transactions, interchange may be reduced, if not entirely eliminated.) A number of merchants and merchant groups have filed lawsuits alleging that the interchange fees set by the Associations for credit card transactions violate anti-trust laws and that the fees paid to accept payment cards are too high. In last quarter of 2006 the Associations began offering pubic access to interchange rate information. Processing fees cover the costs associated with data processing services and vary depending on the size and number of transactions the merchant submits per batch. The processing fee may include data capture and authorization costs. It might go directly to the bank if it handles the processing or to the bank's third-party processor. The ISO/MSP fee is the amount the acquiring bank pays the ISO/MSP for services provided. It is negotiated and often represents a percentage of the volume that the ISO/MSP-sponsored merchants bring to the bank. The fee agreement between the bank and the ISO/MSP is normally considered when pricing merchants obtained through an ISO/MSP. The agent commission is a fee passed to the agent bank for signing a merchant. This fee could be built into the discount rate or be assessed separately. Acquiring banks sometimes offer other programs to generate fee income (for instance, equipment leasing). Instances in which management has not researched the legal and compliance aspects of products or services offered or has not priced the programs adequately warrant scrutiny. Examiners should evaluate management's practices for ensuring that merchants are priced appropriately throughout the life of the contract. Best practices by management may include verifying actual volumes and ticket sizes after signing a new merchant (for example, at six months into the relationship) to ensure consistency with volumes and ticket sizes anticipated. Examiners should assess management's practices for ensuring the discount rate is in line with the application estimate and original pricing model assumptions. In general, a failure by management to review all significant merchants for repricing at least annually elevates concern. Further, if any merchants are or have been unprofitable, examiners should accordingly inspect management's repricing practices for those merchants. Merchant agreements typically allow acquiring banks to increase pricing at any time during the contract's life. Merchant programs can be profitable. Although competition with third-party processors has lowered margins, banks have been able to compete due to their strong marketplace presence. Banks are able to generate new merchant accounts through their branch networks and existing customer relationships. Merchant processing is characterized as a high transaction volume, low profit margin business. Only efficiently run departments with strong cost controls can operate profitably. Examiners should analyze profitability reports used by the bank to measure the profitability of the merchant processing operations to determine if it is consistent with the size and complexity of the operations. Reports should detail key performance measures such as net income to sales and net income per item. Ideally, it should be able to segment profitability by merchant, acquisition channel, and industry. Examiners should normally expect profitability analyses for merchant operations to be distinctly separate from the analyses of other banking activities and to include all direct and indirect costs. Direct costs include costs such as those for internal data processing, merchant accounting, fraud and charge-back losses, personnel, and occupancy. Indirect costs may include corporate overhead expenses such as those for human resources, legal, and audit services. The level of detail and frequency of board reporting is contingent on the size of the operation in relation to the overall operations of the bank and its capital base. Management's ability to quickly detect fraudulent activity is important in controlling losses. The merchant, then its acquiring bank, are the parties liable for certain types of losses. Persons possessing stolen credit cards sometimes take advantage of unsuspecting store clerks, or merchants sometimes perpetrate fraud. Merchant fraud can be extremely costly if not discovered quickly. Examples of merchant fraud include factoring and draft laundering. New merchant accounts are particularly susceptible to fraud such as bust-out scams. Examiners should insist that banks have a fraud detection system to identify and monitor potentially fraudulent activity. Fraud identification that relies exclusively on excess charge-back activity analysis is normally cause for concern because there are a number of other indicators that can point to fraud. A primary tool used by management for fraud detection is an exception report that details variances from a multitude of parameters established at account set-up. Along with charge-backs, basic parameters usually include daily sales volume, average ticket size, multiple purchases of the same dollar amount, multiple use of the same cardholder number, percentage of keyed versus swiped transactions (because keyed transactions frequently are associated with card-not-present transactions which are normally higher-risk), number of authorizations declined, authorizations during non-business hours, and high volume of authorizations in relation to transactions. A daily exception report lists merchants that are outside of any of the parameters. Most large-volume processors have established exception parameters based on industry or merchant type. Examiners should review management's practices for periodically updating parameters. For example, management might set the daily sales threshold at a percent of a prior timeframe's activity (for instance, 110 percent of the three months' average). The margin allows for normal growth of the merchant and compensates for seasonal sales patterns. Some banks use neural network technologies for fraud detection. These complex computer programs can compare each transaction against the merchant's prior sales patterns. Though more sophisticated than a traditional exception report, smaller merchant processors may be unwilling or unable to purchase these technologies on an ongoing basis. Instead, some acquiring banks selectively route higher-risk transactions through a neural network while confining the remainder of transactions to exception reporting. Some banks also use Informational databases (such as those for scoring, bankruptcy, trade, and fraud) to identify at-risk merchants. Merchants that have financial or legal difficulties often have a higher propensity to falsify transactions. Associations provide educational materials to acquiring banks and merchants about the industry's latest fraud detection techniques. They also prepare fraudulent activity reports for each acquiring bank. The reports are not intended to replace the bank's own fraud system. Rather, examiners should expect to see that such reports supplement the internal system. Certain circumstances require management to document its plan to correct a merchant's unacceptable sales practices. Inactive merchant accounts can signal potential fraud. For example, inactivity could signal a bust-out scam wherein a fraudulent merchant signs with several acquiring banks simultaneously, moving from one to the next as the scam is perpetrated or detected. When exception reports flag an inactive account, management normally follows up with the business owner. Evidence that credit card purchases have been intentionally structured by a merchant to keep individual amounts below the "floor limit" to avoid approval requirements. Merchant account activity that reflects a substantial increase in the number and/or size of charge-backs. Merchant's deposit of sales drafts made payable to a business or businesses other than the business named on the account. Merchant's frequent request that funds be wire transferred from the merchant account to other institutions in other parts of the country or to offshore institutions almost immediately after deposits are made. Merchant that is engaged in telemarketing activities and is the subject of frequent customer complaints. Merchant account deposits that appear to exceed the level of customer activity observed at the merchant's place of business. Merchant that has access to electronic data capture equipment but frequently inputs credit card account numbers manually (for example, if manually keyed transactions exceed 10 percent of total transactions). Merchant that has a sudden or unexplained increase in the level of authorization requests from a particular merchant location. Examiners must expect management to take swift action when it encounters suspicious transactions or other suspicious activity. Management's investigation may include verifying purchases with the issuing bank and/or obtaining copies of paper-based transaction tickets from the merchant. An acquiring bank's quick response will help minimize losses to it and the issuer as well as provide timely information to law enforcement agencies. Changes in a merchant's business operations such as changes in ownership, business principals, bank accounts, merchandise, sales methods, or target market normally also warrant an investigation. Merchant agreements normally allow the acquiring bank to delay settlement until questionable transactions are resolved. Once fraud is suspected, management must follow Suspicious Activity Report (SAR) guidelines. Examiners should evaluate the bank's processes for terminating fraudulent merchant accounts and placing such merchants on MATCH. They should also consider the acquiring bank's and its processor's practices for suspending or blocking settlement and authorization processing to a terminated merchant's account. Such procedures are intended to prevent further deposits and account testing. Credit risk arising from charge-backs is an acquiring bank's primary risk and can result in significant financial loss. If a merchant is unable to pay its charge-backs, the acquiring bank must pay the issuing bank. Large charge-back losses can also result from deliberate fraud undertaken by the merchant. For example, a merchant might sell deceptive or misleading merchandise or never deliver the product. Authorization issues, inaccurate or incomplete transaction information, and processing errors can also result in charge-backs. Charge-backs are governed by a complex set of rules and time limits that can be costly to merchants and acquiring banks if disregarded. Charge-back losses realized by the bank are listed as other non-interest expense on the Call Report. The most effective preventive measure against charge-back losses is thorough underwriting prior to merchant acceptance. Nonetheless, examiners should expect that an acquiring bank have strong controls in place to accurately and timely process charge-backs and retrieval requests. The bank may lose a charge-back dispute (thus resulting in a loss) if it does not adhere to charge-back rules. The absence of effective charge-back monitoring to identify problem merchants for remedial action normally draws examiner attention. Quickly considering problem merchants for termination may help avoid or limit loss. Cardholders initiate charge-backs, for instance when they are dissatisfied with the product, did not receive the merchandise or service, or did not authorize the charge. A consumer first tries to resolve the dispute with the merchant. If unsuccessful, the consumer informs the issuing bank about the dispute, and the issuing bank posts a temporary credit to the cardholder's account. The issuing bank then requests documentation from the merchant to authenticate the transaction and possibly resolve the dispute. If the dispute is upheld, the amount is charged back to the merchant's account and the consumer does not pay for the disputed charge. The consumer has 60 days from the day he or she receives the statement to report a dispute to the issuing bank. Issuing banks can also initiate charge-backs when the merchant does not follow proper card acceptance and authorization procedures or when there is a problem with the credit card account (for example, it is not valid or has been terminated). The acquiring bank's contingent charge-back liability generally spans 90 to 120 days (but up to 180 days for certain transactions). Associations have strict charge-back processing regulations. For example, charge-backs occur when a merchant fails to provide copies of requested sales tickets. If the merchant does not fulfill retrieval requests within prescribed time frames, it loses the charge-back dispute. Merchants must also follow other card acceptance procedures, including obtaining authorizations, as depicted in the governing documents. The Associations notify acquiring banks about high charge-back merchants. Once management has received notification of excessive charge-back activity, examiners should expect management to promptly take appropriate steps to bring charge-back rates down to acceptable levels. The steps may include, but are not limited to, reviewing procedures with merchants or developing a detailed and comprehensive charge-back reduction plan. If the charge-back volume is not sufficiently reduced within established timeframes, the Associations may impose substantial fines against the acquiring bank. Although the Associations notify acquiring banks about merchants with excessive levels of charge-backs, examiners normally have concern when an acquiring bank's own risk management practices do not detect such merchants or when charge-back processing staff is not alert for merchants with excessive retrieval requests or charge-backs. Numerous charge-backs could indicate an unscrupulous merchant or a need for additional training. Acquiring banks often establish specific merchant reserve accounts, or holdback reserves, for higher-risk or high-charge-back merchants. Holdback reserves are also used to limit a bank's credit risk when the merchant's product or service involves future/delayed delivery. They are funded by a lump sum payment or by withholding part of each day's proceeds. Examiner should expect these types of specific reserve accounts to be adequately funded. The acquiring bank might also fund a general allowance account, similar to the ALLL (although not commingled therewith), for a portfolio of merchant accounts. The method used to determine the allowance allocation varies but is typically based on contingent charge-back exposure for the entire portfolio. Such an allowance is reported as an "other liability." Examiners should analyze management's merchant reserving methods to determine whether these types of allowances are sufficiently funded. An acquiring bank might also obtain merchant charge-back insurance which is intended to provide protection against uncollectible charge-backs. While insurance products potentially provide some level of protection, they are not a substitute for strong risk management practices. Insurance contracts frequently include significant limitations or restricting clauses that constrain the usefulness of the contract in the event of an actual loss (for instance, limits on types of losses covered and restrictions based upon bank management's action or inaction in managing the merchant portfolio). In addition, the insurance carrier might not have the financial ability to fund the contract in the event of significant loss. Larger merchant processors employ collectors to recover charge-back losses and other fees. A collector seeks remedy from the principals of the business through negotiations or civil action. Management is expected to appropriately detail charge-back losses on Call Reports as other non-interest expense and reverse any uncollectible fees from income in a timely manner. Any collected funds are to be reported as other non-interest income. A BIN18 is a number assigned by an Association to identify the bank for authorization, clearing, settlement, card issuing, or other processes. Ownership and usage of BINs can result in significant credit risk exposure if not appropriately controlled, especially when the acquiring bank owns a BIN and permits other entities to share in the usage, otherwise known as an acquiring Rent-a-BIN. The concept of Rent-a-BINs (RAB) was introduced earlier in this manual. There are issuing RABs and acquiring RABs. Issuing RABs were the focus of the Credit Card Issuing Rent-a-BINs chapter while acquiring RABs are discussed here. Acquiring RABs draw their names from the characteristic of acquiring merchant contracts and cardholder transactions. Under an acquiring RAB arrangement, an acquiring bank permits ISO/MSPs to use the bank's BIN(s) to acquire merchants and settle their credit card transactions. The ISO/MSP retains the majority of income, and the BIN-owner receives a fee for the use of its BIN(s). Although it has minimal operational involvement, the BIN-owner has primary responsibility to the Association if any user fails to perform. The BIN-owner retains the risk of loss as well as responsibility for settlement with the Associations consistent with the contract between the bank and the Association. Thus, examiners should insist that management rigorously oversee and control acquiring RAB arrangements to ensure that the ISO/MSP is appropriately managing the risks. Oversight controls are important, even if the ISO/MSP shares liability with the bank. A failure by management to consider any lending relationships the bank has with ISO/MSPs in analyzing total risk exposure warrants examiner attention. Given the substantial risk involved, many banks are reluctant to enter into acquiring RAB arrangements. Risk also exists when an acquiring bank uses a BIN owned by another bank. If the BIN-owning bank fails to perform, the Associations may hold all of the BIN-users liable. RABs require close examiner analysis of the acquiring bank's program to determine the extent of risk to the bank. The success of a payment system depends on the credit quality of its participants and its operational reliability. As mentioned, the presence of third parties coupled with the bank's ability to sub-license the entire merchant program, or part thereof, to other entities, introduces numerous complexities in the transaction and funds flows related to credit card transactions. Third parties such as ISO/MSPs and servicers are used by acquiring banks for a variety of functions like soliciting merchants, merchant application processing, charge-back processing, fraud detection, customer service, accounting services, selling/leasing electronic terminals to merchants, transaction processing, authorizations, and data capture. Each acquiring bank's program is unique regarding the number of third parties used and the services provided. Examiners should require that banks have proper risk management policies and procedures to control the applicable third-party risks. An acquiring bank, as the Association member, is ultimately responsible for the settlement of transactions processed through its BINs, regardless of the third parties used and the contents of its contracts with those parties. The acquiring bank (BIN-owner) needs to take an active role in ensuring the quality and integrity of the services these third parties provide because the quality of services among third parties varies greatly. Examiners should pay close attention to instances in which the bank relies on the guarantee of a third party against losses as a substitute for prudent risk management. Losses associated with high-risk or fraudulent credit card activity can be substantial and easily reach figures well beyond the means of a seemingly financially capable third party. Banks have incurred significant losses from failing to control third-party activities. Uncontrolled growth, fraud, and inadequate operations by the third parties have all resulted in significant problems for banks. ISO/MSPs in particular could be motivated by their own profits at the expense of merchant portfolio quality and often have limited financial capacity. Regardless of the third parties used and any guarantees provided, the examination approach requires that bank staff have the expertise and knowledge of the business to properly manage the risks and that management have a sound plan for managing its merchant program as well as policies and procedures in place to control the risks associated with using third parties and to properly limit the use of the bank's BINs by others. For instance, the final review of merchant applications and the decision to approve or decline a new account should be controlled by the BIN-owner. A due diligence process to: determine the third party's character and ability to perform the services; assess the risks associated with using the third party; and establish risk controls. A process for ensuring the adequacy of written agreements. A monitoring process for the third party's operations and financial condition. Determining that the third party has the operational and financial ability as well as expertise to perform the services. Performing thorough background checks on the third party's principals and key individuals to determine their good standing, including bank and trade references, credit reports, and, where appropriate, criminal backgrounds. Analyzing the financial capacity of the third party and its principals to determine continued viability and capacity to absorb losses. Assessing the third party's marketing practices and the types of merchants targeted. Assessing the risks associated with the use of the third party and the controls needed to manage the risk (for example, underwriting standards, security of sensitive information, reporting requirements, and procedures for settlement, charge-back processing, fraud monitoring, and pricing). Establishing criteria for requiring additional loss controls, such as reserves or security deposits to absorb losses stemming from merchant fraud and charge-backs. Ensuring separation of duties for activities performed (for example, the individual conducting the on-site inspection should have no financial interest in its outcome). Registering third parties with Associations as required. Periodically reviewing the financial condition of third parties and their principals to determine capacity to meet commitments and remain in good standing. Reviewing allowances to ensure they are consistent with the condition of the third party and volume of business generated. Reviewing compliance with the bank's established requirements (for example, underwriting standards, settlement and charge-back processing, fraud monitoring, merchant pricing, and security of cardholder information). Periodically evaluating the third party's internal controls (for example, through review of operational audits). Assessing system audits for third parties performing processing tasks. Reviewing contingency plans to assure continuity of operations. Documenting the bank's relationship with the third party. Checking compliance with contractual provisions. Determining the adequacy of the bank's controls over third party access to sensitive information. Concerns arise when management has not obtained a signed, written agreement between it and each third party or when the agreement fails to take into consideration business requirements, key risk factors identified during the due diligence process, and the Associations' regulations. Legal counsel familiar with merchant processing normally reviews contracts prior to signing. Terms specifying compensation, payment arrangements, price changes, and time frames. Provisions prohibiting the third party from assigning the agreement to any other party. Frequency and means of communication and monitoring activities of each party. Provisions regarding the ownership, confidentiality, and non-disclosure of cardholder information as well as compliance with cardholder information security standards. Recordkeeping requirements and whether each party has access to these records. Responsibility for audits, the bank's access to those audits, and whether the acquiring bank has the right to perform an audit of the third party. Notification requirements of system changes that could affect procedures and reports. Type and frequency of financial information the third party will provide. Termination parameters, including potential penalty provisions. Maintenance of an adequate contingency plan by the third party. Tying compensation to the merchant portfolio's performance (for instance, charge-back activity). Defining responsibilities for fraud and charge-back processing and losses. Requiring security deposits from the ISO/MSP, particularly if its financial condition is weak or the quality of the merchants it solicits presents significant risk. Establishing remedies to protect the bank if the ISO/MSP fails to perform (for example, indemnity provisions, early termination rights, and delayed payment). Providing criteria for acceptability of merchants. Specifying that the bank owns the merchant relationships. Controlling the future use and solicitation of merchants. Defining the allowable use of the name and logo of the bank and the ISO/MSP. Permitting bank employees to conduct onsite inspections of the ISO/MSP. Specifying that all applicable regulations and Association rules are to be followed. The bank's risk management program needs to consider the Associations' requirements regarding third parties. Each acquiring bank is expected to register third parties according to the Associations' guidelines before accepting services. Associations generally require an initial registration fee and annual fees for each third party under contract. The fees are normally passed on to the third party. All new merchant accounts should be reviewed with final approval controlled by the acquiring bank. A registered third party cannot subcontract its bankcard-related services to another business. Bankcard-related services can only be provided by businesses with a direct written contract with an Association member. All aspects of a member's relationship with a third party should be documented. Members are responsible for ensuring that merchants receive payment for the card transactions deposited. Even after registration, the acquiring bank remains responsible for ensuring compliance with the Associations' operating regulations. The regulations make the acquiring bank liable to the Associations for the actions of third parties. Banks are to periodically submit certain information on third parties used to the Associations and can be fined by the Associations for not doing so. Agent banks contract with merchants on behalf of an acquiring bank. Agent banks are typically community banks that want to offer merchant processing services to their merchant customers but that do not have the management expertise and/or do not want to invest in the infrastructure needed to serve as an acquiring bank. Acquiring banks generally provide backroom operations to the agent bank. Depending upon the contractual arrangement, the agent bank may or may not be liable to the acquiring bank in the event of charge-back or fraud losses. Agent banks with liability typically perform merchant underwriting. Agent banks without liability are typically called referral banks. In a referral arrangement, the acquiring bank performs the underwriting, executes the merchant agreement, and accepts responsibility for merchant losses. Acquiring banks sometimes compensate the referral bank byway of a referral fee. If examining an agent bank, examiners should determine whether management fully understands the bank's financial liability for charge-backs as well as its responsibilities under the agreement with the acquiring bank. An agent bank should have appropriate procedures in place to ensure it fulfills its obligations under such agreement. Examiners should expect that agent banks with liability have proper risk management policies and controls in place for merchant underwriting and monitoring, pricing and profitability, and third-party relationships. Examiners should determine whether management of an agent bank has ensured underwriting guidelines meet the acquiring bank's underwriting standards, at a minimum, and represent an appropriate level of risk for the agent bank to hold. Acquiring banks may decline a merchant if it poses undue risk or does not meet the bank's minimum standards. Other agent bank tasks include performing ongoing monitoring of sales, charge-backs, and fraud. Examiners should look for evidence that pricing of agent relationships is sufficient to cover costs, including any fees paid to the acquiring bank and anticipated losses. Depending on the size of the agent bank's merchant portfolio, separate profitability reports on this business line may not be necessary. But, that does not negate management's responsibility to determine if the service is profitable to the bank. If profits are minimal or non­existent, considerations would include whether the risk is sufficiently offset by the intangible benefits gained from offering the services. Examiners should expect to see a written agreement clearly outlines both agent and acquiring banks' responsibilities. They should also determine whether the agent bank has performed appropriate due diligence regarding the acquiring bank's ability to meet its obligations under the contract and, similarly, whether acquiring banks have put appropriate controls in place regarding the use of agent banks. Examiners should evaluate controls for maintaining appropriate underwriting standards and processing volumes and for monitoring the agent's financial condition and processing volume. Instances in which the financial condition is not consistent with its merchant portfolio risk profile and/or the activity's volume normally raise concern. Examiners should pay attention to situations in which management has failed to fully understand the total risk exposure when lending to third parties that perform services for the bank, including for its merchant program. The lending relationship creates a potential conflict of interest and increases the bank's overall credit risk. The risk exposure is not only the loan(s) to the third-party but also the contingent liability from merchant processing activities by the third party conducted through the bank's BIN. Lending to a third-party organization sometimes results in management failing to take appropriate action against the third party when problems are identified. For example, management may not want to stop processing for the ISO/MSP because it may jeopardize repayment of the bank's loan. As a result, management could continue with a problem relationship, which may increase the problems and subsequent losses. Examiners should evaluate management's processes to determine and control total risk exposure. Concerns also surface when acquiring banks have not ensured that third-party processors and network providers have contingency plans in place to continue operations in the event of a disaster. If an ISO/MSP is providing the backroom operations, examiners should confirm whether management has ensured that the ISO/MSP has a proper contingency plan. The examiner should determine management's practices for requesting and reviewing contingency plans. Further, the merchant processing examination should include IT examiners to the extent needed to review the adequacy of the contingency plan as well as the bank's in-house data processing systems for merchant processing. Cases where disclosure of cardholder information is not in accordance with privacy regulations and the Associations' guidelines warrant scrutiny. Inappropriate disclosure to third parties could result in substantial liability to the bank, especially if the third party perpetrates fraud. Association regulations prohibit an acquiring bank from disclosing cardholder and transaction information to third parties, other than to its agents for the sole purpose of completing a transaction, without the prior written consent of the cardholder's issuing bank and the Association. The Associations' regulations also state that if an acquiring bank discloses the information, the acquiring bank must ensure that its agents and their employees make no further disclosure and treat the information as confidential. The emphasis of the privacy regulations is on providing customers a notice of the bank's disclosure practices and an opportunity to opt out of the disclosure. The regulations also prohibit the disclosure of certain cardholder information for marketing purposes, with certain exceptions. Periodic reviews performed on the acquiring bank by an Association. Excessive volumes of charge-backs at the merchant and bank portfolio levels. Fraud or other suspect activity at both portfolio levels. Risk limits on activity, or collateral requirements, imposed on the acquiring bank due to the level of risk in the acquiring bank's portfolio. Examiners should closely review correspondence between the bank and the Associations. Banks should also have the applicable Association's by-laws, regulations/rules, and other guidance on hand for review if necessary. Reviewing the bank's strategic plan to determine how (and if) merchant processing fits into the bank's objectives. Evaluating the bank's merchant processing policies, including, but not necessarily limited to, those covering merchant selection, underwriting, and monitoring. Reviewing correspondence between the bank and the Associations regarding the bank's merchant processing activities. Determining the quality of the bank's merchant portfolio, including the identification of any high-risk merchants. Sampling recently approved (such as within the last 90 days) merchant files. Identifying the volume of merchant processing transactions, comparing that volume to the bank's capital level, and determining if additional capital support is necessary. Reviewing the trends in the volume and aging of charge-backs, and determining what charge-back losses the bank has suffered. Gauging management's ongoing review processes for merchant accounts. Assessing agent-bank programs and determining level of liability under such programs. Analyzing pricing practices and models as well as profitability of the merchant program. Also, considering whether merchant relationships are profitable and investigating as necessary (for example, if a significant relationship is not profitable). Reviewing budgeting and forecasting processes for merchant processing activities, including assumptions used. Reviewing the settlement flow chart and the bank's practices for paying merchants. Identifying what third parties the bank uses for its merchant activities and reviewing controls over third-party risks. The analysis should include reviewing governing contracts or agreements for significant relationships. Assessing the adequacy of holdbacks or other merchant reserves. Inspecting contingency plans, calling on IT specialists as necessary. Reviewing routine MIS for the merchant processing program. Assessing whether management possess the necessary skill-sets to properly management the program. Reviewing merchant program sections of internal and external audit reports. Determining whether any planned changes exist for the merchant operation. If changes are planned, identify how the changes may impact the bank, specifically as related to higher risks that the bank may be taking on. 13 The model and discussion generally mirror the model and discussion that is presented in the FFIEC IT Examination Handbook, Retail Payment Systems Handbook (March 2004). 14 Acquiring banks generally pay merchants by initiating Automated Clearing House (ACH) credits to deposit accounts at the merchants' local banks (possibly an agent bank). If an acquiring bank employs a third-party card processor, the card processor usually prepares the ACH file. 15 As per press release PR-90-2000. 16 This calculation converts the off-balance sheet activity (merchant sales settled) to an on-balance sheet risk-weighted item. The 2.5 figure represents a 2.5 month average liability for charge-backs that is based on the premise that most charge-backs run off within 2.5 months. Technically, there is a potential 6 month window of charge-back liability. The 20 percent figure is the factor to convert the off balance sheet transactions subject to recourse to an on-balance sheet item. The 100 percent figure represents the risk weight applied based on capital regulations. The resulting risk weighted off-balance sheet items for merchant processing would be included in the denominator of the risk based capital ratios. 17 According to the article entitled "Merchant Acquirers and Payment Card Processors: A Look Inside the Black Box," authored by Ramon P. DeGennaro, and housed in the First Quarter 2006 edition of the Economic Review (Federal Reserve Bank of Atlanta). 18 An ICA number, which is similar to a Visa BIN, is assigned by MasterCard. ICAs and BINs are collectively referred to as BINs in this manual. Examiners may also encounter arrangements with American Express and Discover, particularly now that their access to banks has expanded.